Give your loved one a Mercury Outboard this Christmas & double your warranty coverage! 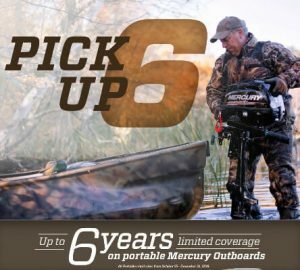 Purchase a new 2.5hp to 25hp Mercury FourStroke outboard tiller handle model between October 25 and December 31, 2018 and get a total of six years of Mercury factory-backed limited coverage! In addition to the standard three-year factory warranty, you also receive a three-year Mercury Product Protection Gold plan! Hurry in now before year end.